Tagged Cincinnati, Gypsy Hut, Miles Benjamin Anthony Robinson, You Better Come...Please? As it may be fairly clear, I’ve slowed down on my blogging. I thought, considering I do have a decent number of readers, that I owed some sort of explanation as to why you havent been hearing as much from me as of late. Really, there are two reason, one short-term and one long, and both keeping me from doing this regularly. The first reason I won’t be making much of an appearance in the coming week is both simple and fantastic. Tomorrow I will be going to Seattle for my brother’s wedding. Obviously trips like this are both enjoyable and event-filled, leaving very little time for me to update you on happenings and interesting things. I’ll be returning on Monday, so hopefully I can start up again around that time. The second reason is not quite as much fun but of equal importance. The reason I’ve been able to write so much on here, as may be evidenced by the title, is that I don’t presently have a job. While I do feel the workaday world is a drag, it is no less important to have a job as dictated by my increasingly ominous financial situation. Anyone that has ever blogged or written a lot knows that even if you are just doing it off the top of your head it is still a very time consuming activity. In effect, as much as I love doing this, the blogging was distracting me from really doing what I needed to be doing, getting a job. Of course, this does seem to fly in the face of the core idea of this whole thing, but it really is an unfortunate truth that we must all create an income in some capacity or another. The key detail that allows the idea of not working and my seemingly contradictory search for a job to stay separate is that one mustn’t let their 9-to-5 rule their life outside of work. The simple truth is that I need to bring in some money so that my care-free, loving-life mentality can be supported during the times I’m not at work. 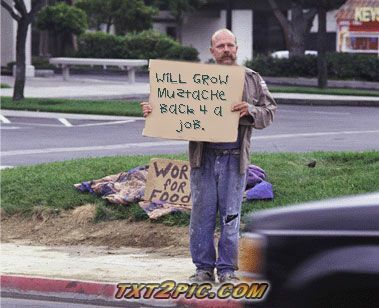 In this unfortunate economy finding a job is an all day thing and I needed to start devoting more of my attention to it. I’ll be back soon enough. 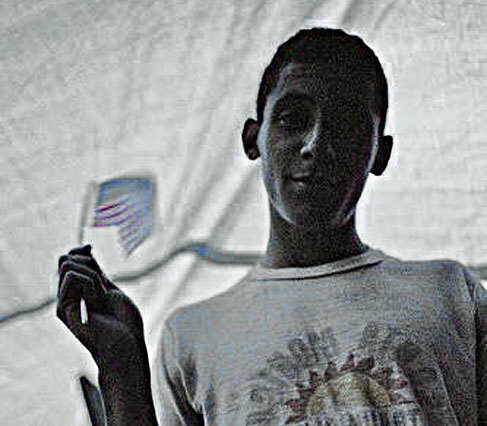 With a little more conscious work put towards getting a job, I’m sure something will present itself much sooner. This means that I will be once again able to compartmentalize my time into work, play, and writing. Things are so much easier to get done when you have less time in the day to do them. So, hopefully I will be returning in full force to my blogging duties soon. For the time being, the updates may be somewhat spare, I am but one man. Also, and this is not meant to sound desperate, if anyone has any good leads on jobs, feel free to contact me. I’m totally fun to work with. 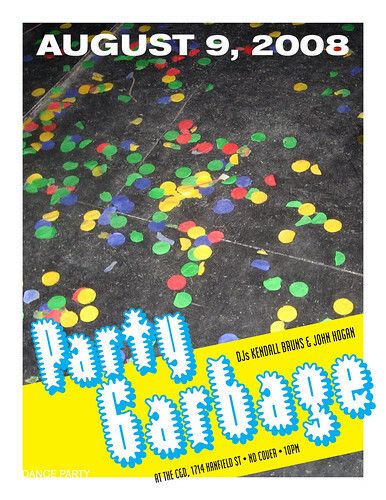 Just like last month, Kendall and I will be DJ’ing at the C&D on August 9 under the moniker of Party Garbage. That’s a Saturday, so there are very few excuses not to come. 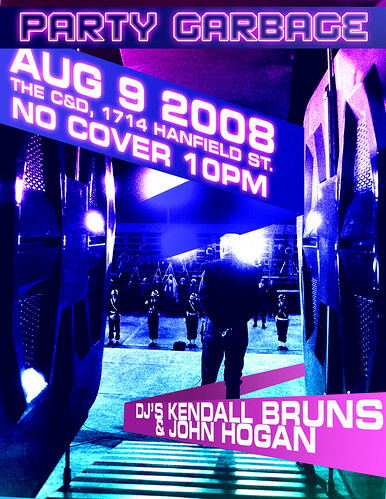 Kendall and I promise more of a party than last time, and that isn’t a promise we take lightly. I think you could be pleasantly surprised by the strides we’ve taken in the last month. I mean, we totally have two posters this month, and I’ve spent a (relative) fortune on things that make a papery mess! So come on over and say “hi,” we don’t bite and we’d love to see you move.